Fan-filmed video footage of GUNS N' ROSES performing the VELVET REVOLVER cover "Slither" and the early GN'R track "Shadow Of Your Love" at this year's Download festival, which took place this past weekend at Donington Park in Leicestershire, England, can be seen below. VELVET REVOLVER featured GN'R members Slash, Duff McKagan and Matt Sorum alongside singer Scott Weiland and guitarist Dave Kushner. "Slither", which was featured on VELVET REVOLVER's debut album, "Contraband", won a Grammy for "Best Hard Rock Performance" in 2005. 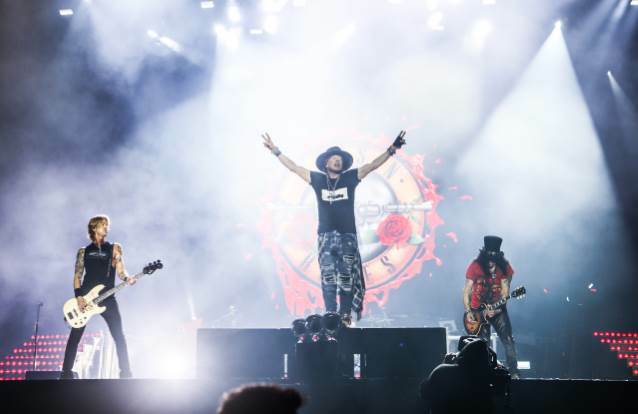 GUNS N' ROSES reportedly rehearsed "Slither" during the 2016 leg of the "Not In This Lifetime" tour, but never performed the song live before its current European tour. Last month, "Shadow Of Your Love" landed at position No. 31 on Billboard's Mainstream Rock Songs chart after being released earlier in the month to promote the upcoming reissue of the band's debut studio album, 1987's "Appetite For Destruction". The song, written by singer Axl Rose and friend Paul Tobias, was originally recorded by Axl's pre-GUNS N' ROSES band HOLLYWOOD ROSE. It then ended up being the first track GN'R ever rehearsed together for "Appetite" producer Mike Clink during studio sessions circa 1986. The "Locked N' Loaded" deluxe boxed set of "Appetite For Destruction" will arrive on June 29 and include 73 songs — including 49 tracks that never before been released — spread out across four CDs and seven 12-inch 180-gram vinyl LPs. A super deluxe version will also include a 96-page book with unreleased photos from Axl's personal archive, new lithographs and a plethora of memorabilia.